The holiday season is upon us once before. As we all slip away to our families, friends, and nutrient-filled gel-tubes to celebrate the brief break in the dystopic darkness of our futurepresent, it’s a good time to reflect on the bright, fun parts of our regular holiday rituals. Like Santa Claus, that omniscient gift wizard from the sky. 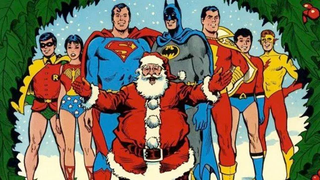 Here’s a fun question: if another character had to take Santa’s place on his yearly crusade of generosity, who would you pick, and why? A superhero is an obvious choice. Superman himself has done the job in a few comics and in one very weird episode of Smallville. Batman could certainly manage, too. Imagine the suped-up Bat-Sled he would build. But there’s a whole world of scifi and fantasy characters who could easily deal with the weirdness of travelling around the entire planet in a night who might be up for the challenge. What do you think? I’m leaning toward an unlikely choice: Dale Cooper, from Twin Peaks. While he would need some help from Santa’s elves to get going on his journey, I can’t imagine a character more generous and warm to do the duty. Though, I mean, he’d probably give everyone coffee and pie. On the other hand, that might not be a bad thing.